A moderator, right, and participant in the VOA Somali service's "Mogadishu-Minnesota" town hall meeting are seen in a screen grab from its Facebook stream. Answering a U.S. teenager's question about vacationing safely in Somalia, President Hassan Sheikh Mohamoud said, "You can come back to Mogadishu — nothing will happen to you." Mohamoud answered questions about terrorism and the Somali diaspora in a town hall hosted by VOA's Somali service Saturday. The program is the first of its kind to connect Mogadishu, the capital of Somalia, with St. Paul, Minnesota, home to the largest Somali community in the United States. Both venues hosted crowds of Somali youth who asked the president questions on extremism, unemployment and education. The town hall was streamed live over the VOA Somali Facebook page. Ayduruus Ahmed Abdirahman, a teenager starting high school this fall in Minneapolis, asked the president in English how he would make the country safer so that kids such as himself would be able to return to their parents' homeland for vacations. "We’re tired of going to Ohio or Seattle for vacations when we have so many beautiful cities back home. But we hear about things blowing up there every day," Ahmed said. "How can you convince our parents that want to bring us home for vacations that safety isn’t a concern?" The boy's question was met with applause. 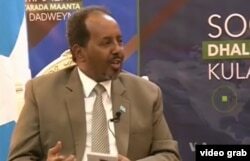 "I assure for all Somalis that the insecurity will be handled soon. We are after the terrorists. We are in war with terrorists, but you can back to Mogadishu and nothing will happen to you," Mohamoud said. Another participant asked if the government's policies have failed to protect Somalis. The president staunchly said no, citing terrorist attacks around the world to prove that such violence can happen anywhere. Somalia President Hassan Sheikh Mohamoud tells a U.S. teenager, "You can come back to Mogadishu -- nothing will happen to you." "I do not believe that our policy has failed," Mohamoud said, referencing "an extraordinary level of insecurity" around the world. "Things that are happening in Mogadishu happen in Paris, Turkey and other major cities in the world. ... We did our best," he added. Somalia's ongoing civil war has displaced thousands of people and crippled its economy. The government continues to struggle to end attacks by the al-Qaida-affiliated terrorist group al-Shabab. Some observers have said Somalis turn to extremist groups because they face difficulties in finding jobs. In Minnesota, men and women with ties to the Twin Cities, as Minneapolis and nearby St. Paul are referred to, have traveled to Syria to fight for the Islamic State terror group. More than a dozen others have attempted to travel to Syria before authorities intercepted them. Since 2007, at least 23 young men from the Twin Cities have left for Somalia, allegedly to take up arms and join al-Shabab, a ruthless and radical Islamic militia vying to topple Somalia's U.S.-recognized government. Mohamed Dahir in Mogadishu said young people are joining terrorists because Mohamoud "does not give them a chance to represent themselves in the government institutions." He asked if the president took responsibility for failing Somali youth. VOA's Somali service hosts a program, the first of its kind, to connect Mogadishu, the capital of Somalia, with St. Paul, Minnesota, home to the largest Somali community in the United States. “I take the responsibility of whatever relates to my responsibility, but I have also got the credit of what I did," the president said. "Four years ago, when I was coming to office, the terrorists were threatening the government, and now you see our army is hunting [them] down in their remote hideouts. "I know they keep carrying out attacks, but that is because of the good security job we did. They are desperate and they want to show the world that they are alive," he said. Abdiwahid Qalinle, a lawyer and member of Somali community in Minneapolis, said, "Extremism and recruiting is not a Somali community problem, it is a Muslim and minority problem. "And the young people are recruited from the internet by extremists who want to reach the young Muslims in the West," Qalinle said. "Mosques play a role in saving the young Somalis in Minnesota. They help them stay away from crime" and help keep them in schools. “Most of those recruited were not exactly connected to the mosques. They were either ignorant of the religion or had little knowledge," he added. However, Hodan Hello, a psychotherapist in St. Paul and a panelist at the town hall, stressed that many positive things are happening in the community as well. Participants in a town hall hosted by VOA's Somali service Saturday conversed with Somali President Hassan Sheikh Mohamoud in Somalia and residents in St. Paul, Minnesota, home to the largest Somali community in the U.S.
"We do not have only negative things," Hello said. "We have successful young people who are lawyers, doctors and some who joined politicians. Extremism and crime are only a tiny part of our major challenges as a community." The town hall meeting was being aired live on Somali National Television and broadcast on Radio Mogadishu, Kulmiye Radio, and other stations throughout the region. In addition to hosting such town halls, VOA Somali produces programming for Somalia’s youth. Just recently, the service began a 30-minute daily radio program for young listeners, providing a new platform for exploring social issues and getting the latest news along with music and technology features.